It seemed like a long time ago. The year was 637 AD, and I was studying under the master Ninja and Carpenter, Sado Asuka. His philosophy was, ‘To master the blade of the Ninja, one must master the tools of the Carpenter’. He said this often. We built a Shinto shrine in his back yard and a rumpus room, for his kids. It was strange that he spoke English, but I digress. One day I was using the hand tools, as I was told, practicing my Miyajim-tsugi, or as the master said, in his best East Anglia accent, ‘halved oblique scarf joint’, when an elder from the village told me that I was needed, to help build a defensive wall, to protect the village from a pending attack. I followed him to the area where the wall had collapsed. Holding true to the teachings of Master Asuka, I used only my hand tools to meticulously cut and join the logs, even though there was a perfectly good Bosch circular saw a mere 5 meters away. Though I knew the circular saw would speed up the construction considerably, I held true to my teachings. Before I had finished the wall, a horde of marauders attacked. Three people died, a dozen people, including myself were injured, and hundreds had their feelings hurt. My injuries were severe and I was to be carted, by ox, to another village, where I could receive better treatment for my wounds. It is unfortunate that on the trip, the ox got spooked and fell off the path, into the ironically named, Ox Death Crevasse, pulling me with him. Neither I nor the ox survived. Many centuries later, when I was reincarnated, as a middle aged woodworker with delusions of blogger, I would remember the error of my ways. It is important to master my hand tools, but it is equally important to get into the habit of finishing projects in a reasonable amount of time. With the memory of my ill fated wall project and the succeeding oxen cart death ride on my mind, I thought about how I might complete the feet on my Krenov saw horses. I also realized that it had been seven days since I had purchased a tool. Seven! In some parts of the country that is almost a week! Though I had considered ordering some chisels, I made the decision to buy a jigsaw instead. Off to Acme tools I went. They had many jigsaws and I had looked at them all before. 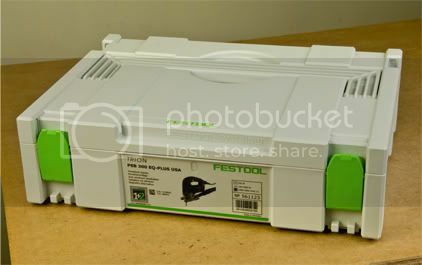 I have researched jigsaws and already knew that I wanted the Festool PSB 300 EQ-Plus. They have this tool and I asked the sales person about it. He pointed out several features that I wasn’t aware of and the deal was done. I bought it. This is not the story of my new jigsaw, but the story of its packaging. He went to the back and got my jigsaw. It comes in a hard plastic case. The handle is in the middle of the lid. It looks strange, but it is actually very comfortable to carry. The latches are heavy duty and fasten securely. The case is molded in such a way that it is stackable. Apparently they have designed the outside of their tool cases to fit together with one another. So if I later purchase their random orbital sander, and I likely will, the case will stack neatly on top of the jigsaw. 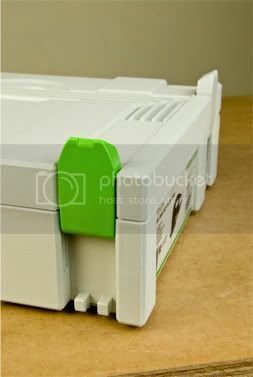 There are also slide up latches that allows one to connect the cases together, so they don’t fall off, if you are pulling them on a cart. Should I also decide to buy one of their uber cool dust collectors, the top of the dust collector is designed for the tools to sit on it, and because it has wheels, you can cart your tools around together. I love brilliant packaging. I haven’t been this excited about the packaging of a product, since I worked at GEICO, “Where a 15 minutes could save you 15% on your auto insurance.”, and a friend showed me the new iPod. He called it a Nano. I had to have one. This was my first iPod. I still have the iPod and the packaging. I believe that the packaging is a good indicator of the quality inside. I know, you can’t always judge a book by its cover, but if a company puts so much time, thought and engineering into the case, it is reasonable that they probably spent some time building a pretty good tool too. So I will finish up my saw horse feet with my jigsaw. The practicing of cutting with my Japanese hand saw will continue. And I will mourn the loss of the villagers and the ox that perished because of my unwillingness to use the right tool for the right job. I am beginning to get the nagging feeling that you are actually an itinerant creative writing professor temporarily banished to the heathen lands of Iowa to do penance for some tawdry affair with mixed metaphors … how else to explain the creativity day after day? Great story! I love history! (even amusing fictional history). Nice score on the jigsaw. 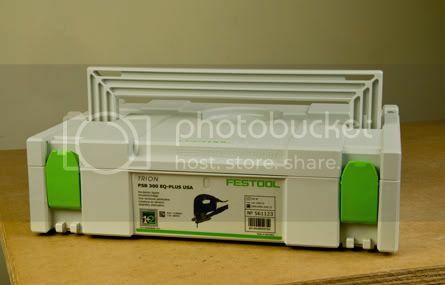 I have always had a great deal of respect for Festool tools but just have not had the “courage” to ask my wife for an advance on my allowance so that I could get some. Great blog. Congrats on the new packaging… oh and the tool as well. And I’m impressed that you were able to remember the lesson from many lifetimes ago. It is so intriguing to see where this will all lead. Yesterday, shortly after I posted the daily drivel, we lost power here in Martelle. It just came on at 7:37 am this morning. Wow it is cold in here. 57 degrees. The worst part is that I still haven’t gotten to try my jigsaw. Oh well, after work today, barring another outage, I will give it a test drive. Well, what Brian failed to mention is that his next incarnation was in the 1800s as a Chinese migrant coal miner named Nianzu. He noticed his fellow miners using handpicks on the coal. Remembering his past experience with hand tools, he pulled out his Harbor Freight jackhammer. This scared his companions who warned him of the dangers of cheap power tools, so he relayed the story of Asuka and his past life experience with hand tools. “Who is Asuka?” his comrades replied. To which Nianzu said “He was a Ninja master!” His friends snickered and said “Dude! Ninja’s are Japanese! What’s wrong with you?” But Nianzu was confident that he knew better and started up his jackhammer. Unfortunately, the bit was not secure, due to a crappy chuck (which, ironically, was made in China) and the bit flew into the ceiling where it broke into an underground river bed. The mine filled up with water, killing all the miners in the process and wreaking great destruction on the earth. That is why Brian is now incarnated into a town of low population, is focused on higher priced tools, and has developed a packaging fetish. Great post Brian :) Your creativity never fails to bring a smile to my face. Your blogs are so amusing as to constitute an addiction in themselves. However, I have my own, self inflicted, addiction. It is in reference to tools (hooda guessed?) and their names. I’m required by the addiction to refer to tools by their proper names, much as I required my students in Vo-Tech to refer to me by my proper name, MISTER. All this leads to my observation that you refer to your new, expensive Festool as “JIGSAW”. I know, I know, everybody, including the manufacturers, call them jigsaws. Please ask Roy Underhill, if you will what a jig saw is. He will then show you his. It is a straight blade stretched between a spring above a table and a treadle driven wheel below. The blade is JIGGED up and down in a wobbly motion derived from its attachment to the wheel. Please allow me to give the correct nomenclature for the tool you bought. Its proper name is SABER SAW. You may refer to it as MISTER if you wish. By the way, I didn’t teach woodworking in Vo-Tech. I taught commercial art. Thanks for your entertaining and addicting blogs. I must point out that the term ‘saber saw’ now really apply’s only to the antique stuff Mr. Underhill uses. A saber tool can only be properly be used from horseback, and while I have a horse in my shop most woodworkers do not even if you do a modern jigsaw cannot be used from horseback unless you have really long extension cords. Can a modern jigsaw be used from the back of my metaphorical horse Ginger? on a galloping hobby horse !